Geology undergraduate student Erin Atchison (left) and doctoral student Tania Leung (right) collect a sediment core from West Okoboji in early May. Betsy Swanner, like many this summer, will head to the lake. But instead of seeking sun and waves, she will look for harmful algal blooms and their effect on water quality. Swanner, an assistant professor in the Department of Geological and Atmospheric Sciences, is investigating how the micronutrient iron contributes to harmful algal blooms so that blooms can be better understood, monitored and perhaps prevented. "Harmful algal blooms are a big environmental problem for water quality in the Midwest and worldwide," she said. "My goal was to initiate some research that would help to understand bloom processes." Harmful algal blooms are caused by cyanobacteria, the bacterial members of the algae often seen at lake surfaces, some of which produce toxins. When nutrients such as phosphorous and nitrogen are high, these bacteria can predominate. The bloom may be seen as floating green specks, scum, or mats in the water. Not all the algae are bad, but when harmful cyanobacteria bloom in excess, they create toxins that can cause nausea, vomiting and liver damage if ingested. This is especially important for municipalities that rely on lake or river water as a drinking water supply. For instance, in 2014, Toledo, Ohio, issued a "Do Not Drink" advisory to 400,000 residents due to a bloom around water intake pipes in Lake Erie that was creating harmful levels of toxins. It is also a concern for recreationalists and livestock. Swanner is investigating how iron, a micronutrient used by many freshwater cyanobacteria, contributes to harmful algal blooms dominated by cyanobacteria. She is an expert in iron cycling, specifically how microbes transform iron from soluble to insoluble forms in their environment. During a large, ongoing algal bloom, algae die, sink, and decompose in a process that uses oxygen. In the oxygen-poor waters beneath the surface, iron may become soluble, making it more readily available as a nutrient for living algae. This may cause a positive feedback that prolongs and intensifies ongoing algal blooms, especially in more shallow water, where this transport may happen more easily. This summer, Swanner will study blooms in West Lake Okoboji and East Lake Okoboji through a partnership with Lakeside Laboratory. East Lake Okoboji, a shallower and smaller lake, connects to the deeper and larger West Lake, where the laboratory is located. Lakeside Laboratory, founded in 1909, is owned by the state and operated through the Board of Regents with a mission to provide science classes and research opportunities for university students and to offer outreach programs and services through the state universities. 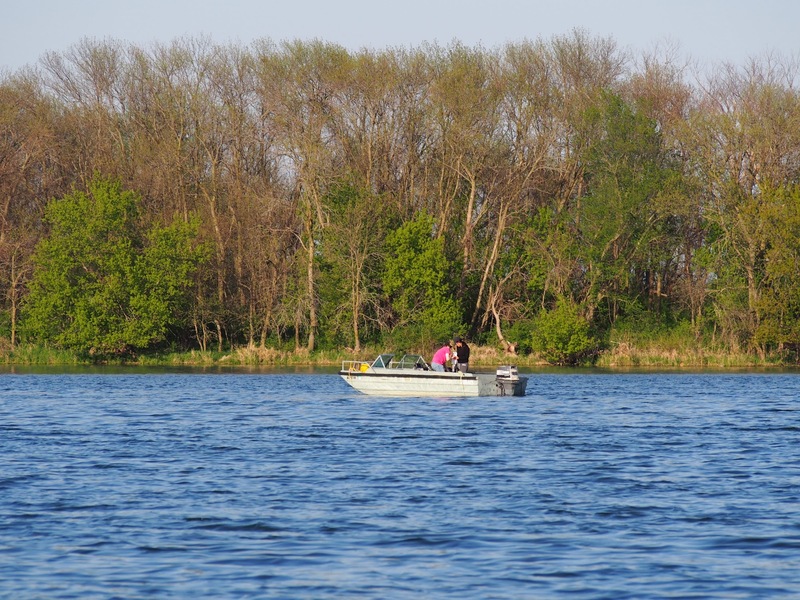 Lakeside Laboratory has partnered with Swanner in this Iowa Water Center sponsored research, and will provide housing, lab space, and a motorboat for the field campaigns this summer. Tania Leung, a doctoral student in the Department of Geology and Atmospheric Sciences, and Erin Atchison (geology ’18) will be sampling the two lakes every few weeks this summer.